The Brewer software and firmware have a number of diagnostic tests that can be run to check the health of the Brewer and to identify and help resolve problems. Please refer to the Brewer operating manual for further information during the tests and checks described below. Note: Kipp & Zonen specialists can carry out a lot of troubleshooting remotely via the computer operating the Brewer. The computer must have an internet connection and remote access via a programme such as ‘Teamviewer’ or ‘Logmein’. These troubleshooting instructions only apply to ‘single-board’ Brewers of the most common configuration. MkII, III or IV with the ‘single-board’ main electronics that has most of the integrated circuits installed in dual-in-line sockets. 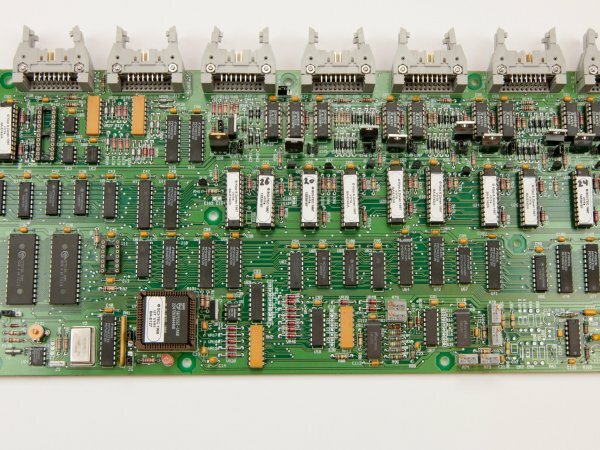 The most recent MkIII Brewers have a main electronics board with surface mount devices (SMD). The layout is similar, but not identical. First-generation ‘multi-board’ Brewers are completely different. Please contact Kipp & Zonen for support. If this message is received then communication has been established between the Brewer and the control computer. If the instrument does not reply, or does not reset (as seen by motors initializing) when instructed by the computer software, or when power is switched on, the problem is probably within the Brewer. However, it may also be in the power or communication cables, the computer or the software. The operating software can be re-loaded onto the computer from the original disc to eliminate it as a potential problem. Ensure that the Brewer configuration files are saved as they contain important operating information such as the COM port number and other variables. Check the configuration files to ensure that none of the files have been corrupted. In order for the Brewer to operate it must receive AC power to its main AC-DC power supply. The AC power cable is connected to the azimuth tracker and then from the tracker to the spectrophotometer by an external cable. There is a power on-off switch and green LED indicator on the spectrophotometer and fuses for the power supply. If the green LED on the Brewer is illuminated, then there is power to the instrument, and the main power supply is producing +5 VDC. If the LED is not illuminated, it may be that the LED is faulty. Switch off the power, remove the spectrophotometer cover and check if the main power supply cover feels warmer than the ambient temperature. If it is warmer, the LED is faulty. If not, AC power is not reaching the power supply. In this case, the AC power source should be checked at the AC outlet and the end-to-end continuity of the power cable tested. The AC power should then be connected directly to the Brewer, by-passing the azimuth tracker. To check the fuse inside the power supply, disconnect AC power from the Brewer, remove the four main power supply cover screws, and check the fuse. Replace it if necessary. When re-installing the cover, ensure that all the power supply connectors are firmly engaged and secure. If the switch and fuses are in good order there may be a fault in the power supply. The main power supply DC output voltages can be checked at the test points on J23 of the main electronics board. Refer to the table below for the correct voltages. If it has been established that there is power at the spectrophotometer, and the motors reset when power is switched on, but that there is no communication between the computer and the Brewer, follow the next steps. A software reset should be attempted after the “Brewer Failed to Respond” message appears on the computer monitor, or if the computer has tried a number of times to establish contact with the Brewer and failed. The software reset is done by pressing  key on the computer, following the error message, or by launching the Brewer software from the DOS prompt. If this fails to establish communications, the serial port may be latched and the computer should be given a ‘cold’ boot (power OFF/ON). Check that the computer serial port is operating correctly by running a serial communications program such as Telix, Procomm, or another ‘terminal’ programme. Plerase note that HyperTerminal is included in Windows™ XP, but not in Windows™ 7. Make sure that the serial communication program is set to 1200 baud, is in full-duplex mode, and the correct serial port has been selected (normally COM 1 for a desktop computer ‘legacy’ RS-232 serial port). Refer to the communications program documentation for correct operation. Remove the RS-422 to RS-232 converter from the computer serial port and connect pins 2 and 3 of the computer serial port together. While running the communication program in full-duplex mode, characters typed should be seen echoing to the monitor. Disconnecting the jumper wire should stop the echo-back. This test confirms that the computer serial port is operating correctly. If the computer did not echo the characters, change the Brewer software configuration to use another port or have the defective serial port repaired before doing any further tests. First check that the isolated RS-422 to RS-232 converter is receiving power from the AC-DC adapter. The adapter output should be approximately +13 VDC with no load, measured on the plug, the centre pin is positive, the sleeve is negative. If measured on the terminal connections inside the converter enclosure, with the adaptor plugged in, it should be about +9 VDC. If the supply voltage is normal, reconnect the RS-422 adapter. The isolated RS-422 to RS-232 converter can be tested inside the converter enclosure by removing the Brewer communication cable from the adapter terminals, connecting pins 1-3, plugging the adapter serial cable into the computer COM port, and checking for echo-back as in ‘testing the serial port’. Now switch connections to pins 2-4 and test again. The RS-422 adapter is operating correctly if characters echo back. If a fault is indicated, then the adapter is defective. If the tests have passed to this point, the communication cable between the Brewer and the computer can be tested. Reconnect the cable to the RS-422 converter and connect it back to the computer. Remove the communication cable from the azimuth tracker surge suppressor box and connect a wire jumper to connect pins C-B. Test the cable by sending characters from the computer as in in ‘testing the serial port’; move the jumper to connect pins I-J and test it again. If this test fails, check the end-to-end continuity of the cable. Reconnect the communication cable to the tracker and disconnect the communications cable from the tracker to the spectrophotometer. Short pins C-B and then pins I-J and check as in ‘test RS-422 converter’. If the test passes, reconnect the cable to the spectrophotometer and open its cover. Turn the power off and disconnect the IDC plug J7 from the main electronics board, this is the connector attached to the shielded ribbon cable shown in the picture below. Use a small wire jumper to connect pins 2-8, and then pins 4-6, using the echo-back test each time. The IDC pins begin from 1 at the triangle stamped on the side of the connector and increment in odd numbers on the same row – 1, 3, 5, 7, 9 on the first row and 2, 4, 6, 8, 10 on the second row, in the same direction. If the test fails at any point of this cable test procedure the faulty connection should be repaired before proceeding to the next test. As an alternative, for testing cables, each line can be tested for continuity by measuring point to point with an Ohmmeter, using the appropriate schematic as a guide. The resistance through the surge arrestor is 10 Ohms, so a typical resistance should be 12 Ohms from the RS-422 adapter to the IDC connector at the Brewer main electronics board. If all of these procedures have positive results, then the problem lies in the Brewer main electronics board. Reconnect all the cabling to the instrument and continue to the next test. If the reset of the motors on power-up is heard and seen, but there is no message sent to the computer, then there may be a problem with the line driver on the main electronics board. Ensure that power is turned off, remove the board cover plate and replace IC U11, (on a socket 50 mm up and 50 mm to the left of the LED). Make sure to use proper grounding precautions before touching the electronics board. On the latest SMD main electronics board the line driver is not in a socket, but it is a modern type and better protected, and unlikely to need replacement. Leave the cover plate off and turn on the instrument. The motors should be observed to reset and if the computer was left in the serial communication program, the Brewer reset message will be displayed on the screen. Exit the communication program and launch the Brewer operating program. Normal Brewer commands can be used for checking correct operation. If there is still no operation, there may be a firmware problem, or a problem on the main electronics board, so the functionality of this board should be tested. There is a Red status LED located near the bottom left hand side of the board. The red LED should be flashing slowly in ‘Cosmac mode’ in ¼ second pulses, as per the following table. If the Brewer is in another mode, change back to the Cosmac mode. If the LED is not flashing, then the correct main power supply voltages should be confirmed. Check the voltages at the main electronics board connector J23, as per section ‘Check main power supply output voltages’. If the power supply values have changed, the power connections should be checked. If they appear normal, and the voltages are still not at proper levels, replacement of the main power supply should be considered. However, there could be a partial short-circuit in one of the assemblies causing the power supply to be loaded. Shut the power off and disconnect the power plugs J1 from the main electronics board and J4 from the lamp control board. Repeat the voltage measurements at the terminal screws on the main power supply and see if all the voltages are present. If the voltages are correct, then determine which assembly is at fault by installing the connectors one at a time and checking which causes the voltage to drop. Replace the main power supply if necessary, and ensure when first turned on that the assemblies are disconnected to allow set-up of voltages to the correct values. The main +5 VDC output is monitored at the main electronics board and should be set to 5.0 VDC, ± 0.1 VDC, with the potentiometer on the main power supply unit. Exit the serial communications program and change to the subdirectory c:\bdata\nnn. Type ‘BREWCMD’ and press enter. Observe if the instrument has responded and note which mode is indicated. The program should display the same mode as indicated by the red status LED. Type ‘readlog’ and press enter to display the past error history, each line displayed will be a possible clue to the problem that caused the failure. If motor failures have occurred, the status will tell you which motor, and what the failure was. Usually, it is a sensor problem, or a wiring problem, that prevents the motor from resetting. If no problems are displayed, then the system can be placed back into cosmac mode for further testing. Type ‘loadmode’ and press enter. Following the return of the confirmation ‘loadmode’ and the prompt, type ‘cosmacmode’ and press enter. The motors will reset and within a minute the system will display the status that it is in cosmac mode. Quit the Brewcmd program by typing ‘quit’ and press enter. Run the Brewer operating program by typing ‘BREWER’ and press enter to check the correct operation of the instrument. Select routines that you are familiar with and ensure that all the functions and data appear normal. Note: Please always include the Brewer type and serial number, your organisation name, and your contact information with enquiries.